Chromecast Cast your favourite entertainment from your phone or tablet straight to the TV. 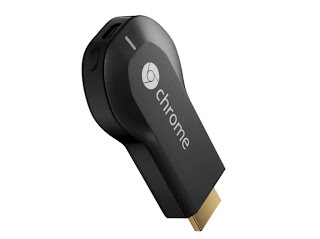 Chromecast is a thumb-sized media streaming device that plugs into the HDMI port on your TV. Simply use an Android phone, tablet, iPhone®, iPad®, Mac® or Windows® laptop, or Chromebook to cast your favourite entertainment and apps right onto the big screen. Everything you love, now on your TV Chromecast works with a growing number of apps. Find your favourite apps and discover more at chromecast.com/apps. A whole new way to TV with Chromecast, your phone is your personalised remote control. You can use it to search and browse, play, pause, rewind, control the volume and even make playlists. While casting, you’re free to use your phone for other things.